Following the tradition of the four previous editions of 2011, 2013, 2015 and 2017, the 5th IAA Conference on University Satellite Missions & CubeSat Workshop represents an international forum on the main topics of the small satellites community. 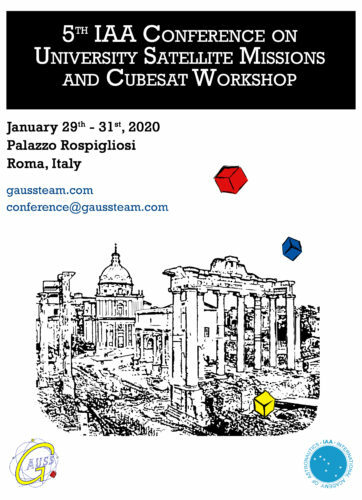 Organized by GAUSS every two years and sponsored by the International Academy of Astronautics (IAA), the Conference offers technical sessions on launch opportunities for universities, ground segment operations, space debris, new perspectives in microsatellites application and CubeSats missions. The event will take place from January 29th to January 31st, 2020, in Roma (Italy), at Palazzo Rospigliosi, in the city centre. Abstracts of the Papers should be submitted to GAUSS through its website, in English. The Papers submitted for the Conference will then be indexed and published as Proceedings in a dedicated volume. Information on ABSTRACTS and PAPERS submissions and on the CONFERENCE PROGRAM will follow.